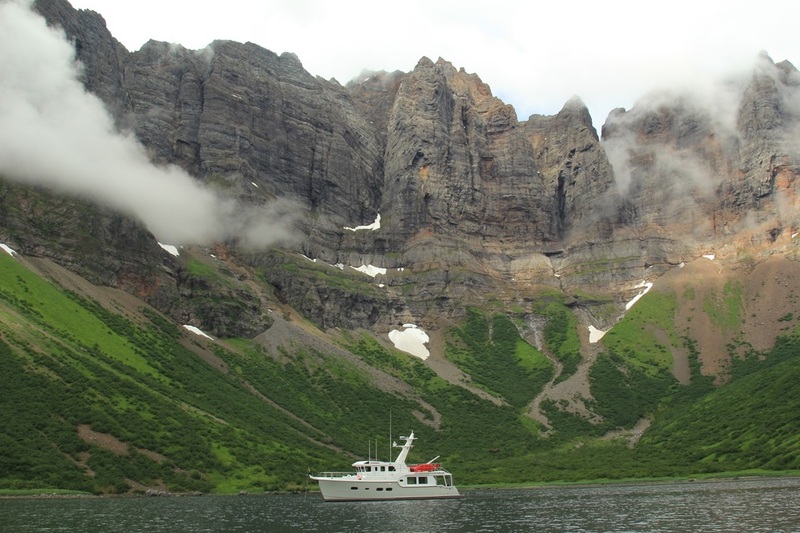 Educational Yacht Charters based on Kodiak Island: Learn yacht systems and boat preparation for advanced cruising while enjoying the luxury of M/V SAMBA and the beauty and wildlife of Kodiak and the Alaska Peninsula. The 3000 foot high walls of Castle Cape and Castle Bay are prominent landmarks along the Alaska Peninsula. As the clouds drift by, covering and revealing the towers, you watch mesmerized by the spectacle. "We have just returned from 9 days at sea with Josh and Natasha Tofield on their N52 Samba. Wow did we have a great time and boy did we learn and experience a lot. I had told Josh on the phone back in March that we weren’t there for a pleasure cruise, we were there to LEARN all aspects of what it is to live aboard a Nordhavn, systems, lifestyle, safety etc etc. Josh took me quite seriously and laid out a curriculum which was comprehensive to say the least. So aside from daily chores ( engine checks, planning (including tides and currents which are not to be taken lightly in the Kodiak area,) preparing meals, navigation, col regs, engine prep and start, etc…)we had a class every morning after breakfast, safety procedures, man overboard procedures, donning a survival suit, learning the various systems, electrical ( on paper and then trouncing around the boat, tracing what we had just learned ). Ditto for hydraulics, water management (all colours) water making (his system is partly manual, 600 gallons a day for keeners) engine checks, ( I did discover a minor leak in the cooling system on the main engine – Josh keeps his engine room immaculate so would be hard to miss a change). Josh and Natasha are terrific and intelligent hosts, great food and good conversation on and outside of NORDHAVN. If any of you think this might be something for you, we have no reservations and would strongly recommend spending some time with Josh & Natasha (with Loxie – their golden lab) on N52 Samba."